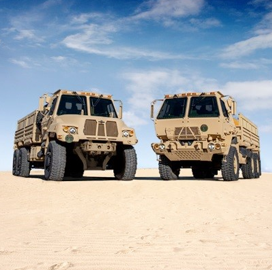 The U.S. Army's Tank-automotive and Armaments Command has ordered $75M worth of tactical trucks and trailers from Oshkosh Defense. The company said Wednesday it will provide 354 A1P2 units from the Family of Medium Tactical Vehicles to the service branch. Oshkosh Defense has delivered over 38,100 FMTVs after it received the initial contract in 2009. Pat Williams, vice president and general manager of Army and Marine Corps programs at Oshkosh Defense, said the company aims to complete the remaining A1P2 shipments and transition to FMTV A2 production efforts. The Army awarded the company an A2 production contract last year to build the A2 variant and has since then built units for use in production verification and live fire tests. Oshkosh noted it expects the latest variant to enter low rate production by fiscal 2021.